I’ve been enjoying the spate of ebook novellas that I’ve been reading lately, and when you toss in the fact that this one is a tie-in to one of my favorite classic television shows, I was quite happy to read this. I’m familiar with the name of Greg Cox, the author of this particular novella, and I’ve enjoyed some of his media tie-in books in the past, so I knew going in that I was likely to enjoy this. And I was right, I got a good, solid work. Though it wasn’t extraordinary, as you always hope it will be. Though the story takes place in the Star Trek universe during the time of the movies, this has the feel of a classic Star Trek episode. In fact, perhaps a little too much so – it reads quite a bit like a direct mash-up of a couple of the episodes. The Enterprise is transporting a group of dignitaries to another planet to attend an important conference. (Sound familiar yet? Of course it does.) The Enterprise receives a signal from a nearby planet, but it is in a language that they haven’t encountered yet so they aren’t able to translate easily. Since it most likely indicates the potential for a first contact but the ship can’t risk a delay in getting the dignitaries to their meeting, Captain Kirk send a shuttlecraft, captained by Mr. Spock, to check out the signal. But the shuttlecraft crash-lands on the planet and the planet, it turns out, harbors some dangerous, violent creatures that quickly dispose of a couple of red-shirt security guards before Spock finds a way to hold the danger at bay and protect Dr. McCoy and Chekov. But Spock’s method means draining his own blood, putting him in a different danger. And if his supply runs out before the rest of the shuttle’s crew will be rescued has he only delayed the inevitable? Will the Enterprise get the original transmission translated? Will they be able to rescue the stranded shuttle crew? Greg Cox has done a nice job of capturing the characters as we know them from their screen appearances. The dialog is realistic and the situations are in line with the stories from the series as well. It is a short book (novella), but it also felt like a short book. It almost felt like a treatise for an episode. Except the episode(s) had already been made (Journey to Babel, Galileo 7, Obsession). But just as the action was reaching a fevered peak, the book ends with almost a deus ex machina intrusion. But again … the format doesn’t provide for anything too lengthy or any real sub-plot development. In the realm of the Star Trek universe and the hundreds of books that have been written in that universe (and of those that I have read), this book does a better than average job of presenting the characters as we already know them and presenting a story that feels right for these characters. Looking for a good book? 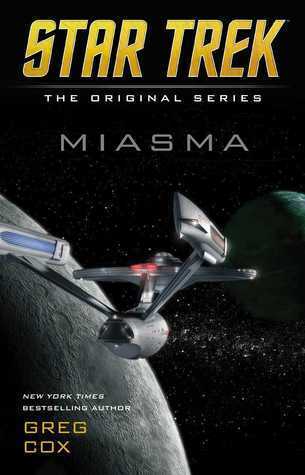 Miasma, by Greg Cox, is a novella set in the Star Trek, The Original Series universe and is a quick, pleasant read, though it won’t bring any new awareness or issues into the fold.